a hernia in which a loop of intestine descends through the femoral canal into the groin. Surgical repair, herniorrhaphy, is the usual treatment. See also hernia. Surgery A hernia in which a loop of intestine droops into the femoral canal. See Hernia. Hernias may be caused by congenital defects in the formation of body structures, defects in collagen synthesis and repair, trauma, or surgery. Conditions that increase intra-abdominal pressures, e.g., pregnancy, obesity, weight lifting, straining (the Valsalva maneuver), and abdominal tumors, may also contribute to hernia formation. Surgical or mechanical reduction is the treatment of choice. A hernia through the abdominal wall. A hernia in which the sac and its contents have passed through the aperture. A hernia that is not easily palpated. A hernia existing from birth. A hernia that protrudes behind the femoral sheath. Herniation of abdominal contents into the thoracic cavity through an opening in the diaphragm. 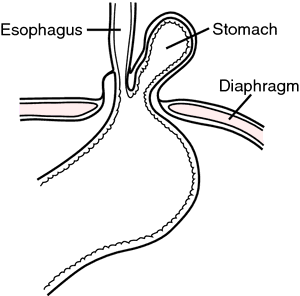 The condition may be congenital, acquired (traumatic), or esophageal. The protrusion of an intestinal congenital diverticulum. A scrotal protrusion that, enveloped in its own sac, passes into the tunica vaginalis. A hernia through a defect in the linea alba above the umbilicus. Protrusion of muscular tissue through its fascial covering. The prolapse of fat from its normal, anatomical position, e.g., from behind the peritoneum into the inguinal canal. 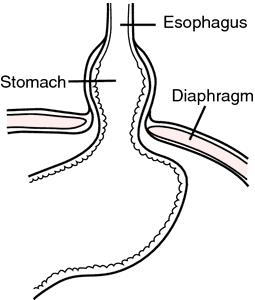 The protrusion of the stomach into the chest through the esophageal hiatus of the diaphragm. A hernia in which the presenting content cannot be returned to its site of origin, e.g., a hernia in which a segment of intestine cannot be returned to the abdominal cavity. It may produce pain or intestinal obstruction. If left untreated, an incarcerated hernia may cause strangulation of the bowel. A hernia through a surgical scar. A hernia that has not gone completely through the aperture. Preoperative: The surgical procedure and expected postoperative course are explained to the patient. The patient should understand that the surgery will repair the defect caused by the hernia but that surgical failures can occur. If the patient is undergoing elective surgery, recovery usually is rapid; if no complications occur, the patient probably will return home the same day as surgery and usually can resume normal activity within 4 to 6 weeks. Patients who undergo emergency surgery for a strangulated or incarcerated hernia may remain hospitalized longer commensurate with the degree of intestinal involvement. The patient is prepared for surgery. Postoperative: Vital signs are monitored. The patient is instructed on the changing of position to avoid undue stress on the wound area. Stool softeners may be administered to prevent straining during defecation, and the patient is instructed in their use. Early ambulation is encouraged, but other physical activities are modified according to the surgeon's instructions. The patient should void prior to discharge and be able to tolerate oral fluids. The patient is taught to check the incision and dressing for drainage, inflammation, and swelling and to monitor his/her temperature for fever, any of which should be reported to the surgeon. Analgesics are administered as prescribed, and the patient is taught about their use and supplied with a prescription for home use. Male patients are advised that scrotal swelling can be reduced by supporting the scrotum on a rolled towel and applying an ice bag. The patient is warned to avoid lifting heavy objects or straining during bowel movements. Drinking plenty of fluids should help the patient prevent constipation and maintain hydration. The patient is advised to make and keep a postoperative surgical visit and to resume normal activity and return to work only as permitted by the surgeon. A hernia that is both femoral and inguinal. A hernia that occurs within the abdominal cavity. It may be intraperitoneal or retroperitoneal. 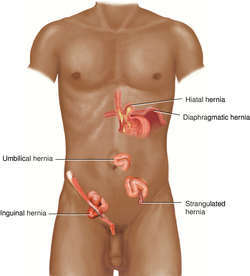 A form of inguinal hernia in which the hernial sac lies between the layers of the abdominal muscles. A hernia that cannot be returned to its original position out of its sac by manual methods. The protrusion of a loop of bowel or other intraperitoneal organ into the labia majora. A hernia through the inferior lumbar triangle (Petit) or the superior lumbar triangle (Grynfelt). It occurs most often in association with surgery on the kidneys or ureters. A hernia between the layers of the mesocolon. A hernia into the canal of Nuck. A hernia through the obturator foramen. 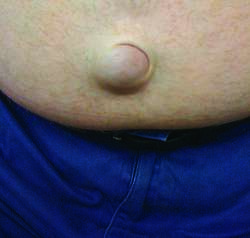 A hernia containing a portion of the omentum. The presence of an ovary in a hernial sac. A hernia in the abdominal wall adjacent to a constructed stoma, e.g., a colostomy or iliostomy. A hernia projecting through the diaphragm into one of the pleural cavities. A hernia whose contents can be replaced by manipulation. A hernia protruding into the retroperitoneal space, e.g., duodenojejunal hernia, Treitz's hernia. A hernia in which only a portion of intestinal wall protrudes, the main portion of the intestine being excluded from the hernial sac and the lumen remaining open. The patient may present with groin swelling and vague abdominal complaints; when incarcerated the hernia may produce bowel ischemia and related complications. A hernia that descends into the scrotum. A hernia in which a portion of the wall of the herniated structure forms part of the hernia sac, e.g. an inguinal hernia in which a wall of the cecum or sigmoid colon forms a portion of the sac, the remainder of the sac being parietal peritoneum. A defect that occurs at or below the linea semicircularis but above the point at which the inferior epigastric vessels cross the lateral border of the rectus abdominis muscle. This type of hernia may contain preperitoneal fat or may be a peritoneal sac containing intraperitoneal contents. It is rare and difficult to diagnose unless large, because it is typically not palpable when small. Large Spigelian hernias may be mistaken for sarcomas of the abdominal wall. Ultrasonography or computed tomography scans are often used in diagnosis. 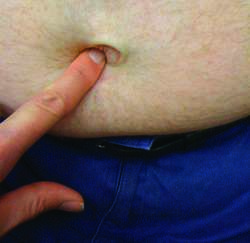 Small Spigelian hernias are easily repaired; larger ones may require a prosthesis. A hernia in which the protruding viscus is so tightly trapped that gangrene results, requiring prompt surgery. Once strangulation of the contents occurs, a nonsurgical attempt to reduce it may severely compromise treatment and outcome. Protrusion of a portion of synovial membrane through a tear in the stratum fibrosum of a joint capsule. A hernia occurring at the navel, seen mostly in children. Usually it requires no therapy if small and asymptomatic. An umbilical hernia usually resolves when the child begins to walk (and muscles strengthen). 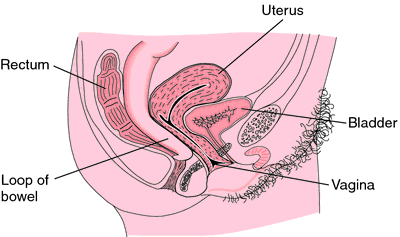 The presence of the uterus in the hernial sac. A hernia of a viscus into the posterior end of the labia majora. The escape of a small knuckle or loop of intestine into the femoral canal-the route in the groin for the passage of the large arteries and veins from the abdomen into the legs. See also HERNIA. Incidence of enterocutaneous fistula along with incarcerated femoral hernia is directly associated with late hospital visit, low socioeconomic status, lack of specialists, and negligence. Magnetic resonance imaging (MRI) can detect and characterize hernias, as well as differentiate inguinal from femoral hernias with a high sensitivity and specificity (Figure 11). Subsequently, the patient was taken to theatre for an exploratory laparotomy, where the presence of the femoral hernia was confirmed, containing part of the caecal wall and the adjacent appendix (Figures 3,4). Many patients with femoral hernia in whom strangulation (6,8) is suspected are elderly and infirm. A decrease in the venous diameter by two-thirds relative to the contralateral side has been shown to be a reliable indicator of femoral hernia. SUMMARY: The femoral hernia is formed when a peritoneal diverticulum 1 passes through the femoral ring. Femoral hernia occurring are very rare and only forms 1. Here we present an unusual complication of the presentation of a strangulated femoral hernia following TEP. A clinical diagnosis of hydrocele of a femoral hernia was made. During the laparoscopic repair of inguinal hernia, not only an occult contralateral inguinal hernia can be identified and tackled in same setting, but also an occult femoral hernia and even obturator hernia can be identified and tackled. This week Miriam concentrates on the femoral hernia, affecting women. Patients with recurrent hernia, femoral hernia, hydrocele and varicocele on the side of hernia.